​Goodwill Wyoming is excited to have our new Girl Scout Program, Girl Scouts of Montana and Wyoming: Good Turn for Goodwill Wyoming, ready for the troops in Wyoming! If you are interested in this great opportunity, please read more below. 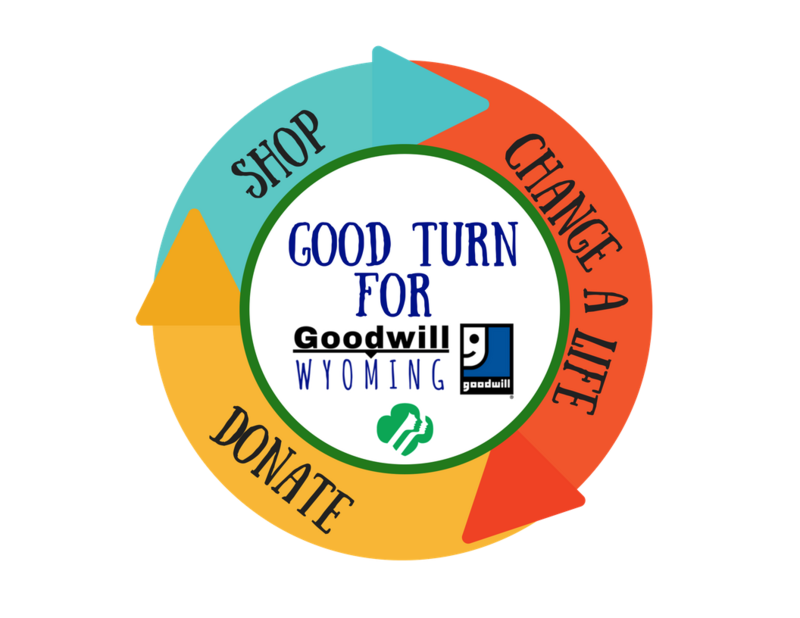 Every Girl Scout who collects and donates items to the Goodwill Wyoming retail stores can earn a Good Turn for Goodwill Patch. The Scout who collects the most donations for the season earns a prize package. The Girl Scouts will have the opportunity to learn about Goodwill’s mission with an exclusive behind the scenes tour of the operation. Every Girl Scout who participates has the opportunity to earn a Good Turn for Goodwill patch, learn about the importance of recycling, and philanthropy. Girl Scout Troops are encouraged to participate as a whole troop and each Girl Scout collects their own donations to turn in. Currently, we are running the program May 1 - August 31, 2018. Troops can participate anytime during those dates. Currently, we offer this program in Cheyenne, Casper, Laramie, and Rock Springs. What Can A Girl Scout Earn? Girl Scouts who participate will earn a Good Turn for Goodwill patch at no cost. The Scout must collect at least six (6) 13-gallon size bags or computer paper size boxes of donations to earn the patch. Donations must be submitted by August 31, 2018. A Scouts who collects 25 or more 13-gallon size bags or computer paper size boxes of donations will receive the Good Turn for Goodwill patch at no cost PLUS a Goodwill “Smiling G” lapel pin for their vest. Donations must be submitted by August 31, 2018. All Scouts who participate will be invited to an exclusive behind the scenes tour of Goodwill and learn more about what Goodwill does in their community. After the tour they will receive a “Ask me about Goodwill” button and a thank you package. Scouts will need to sign up in advance to attend. This will be a one-time event each year on a Friday during the summer months.